A recent report published by Infinium Global Research on intimate hygiene market provides in depth analysis of segments and sub-segments in global as well as regional intimate hygiene market. The study also highlights the impact of drivers, restraints and macro indicators on the global and regional intimate hygiene market over the short term as well as long term. The report is a comprehensive presentation of trends, forecast and dollar values of global intimate hygiene market. According to report the global intimate hygiene market is projected to grow at a CAGR of 4.3% over the forecast period of 2018-2024. The global market for intimate hygiene products is mainly focused on the products for women, however, with the increasing awareness about the intimate hygiene products and increasing demand for men’s grooming products, the demand for intimate hygiene products for men is on the rise. 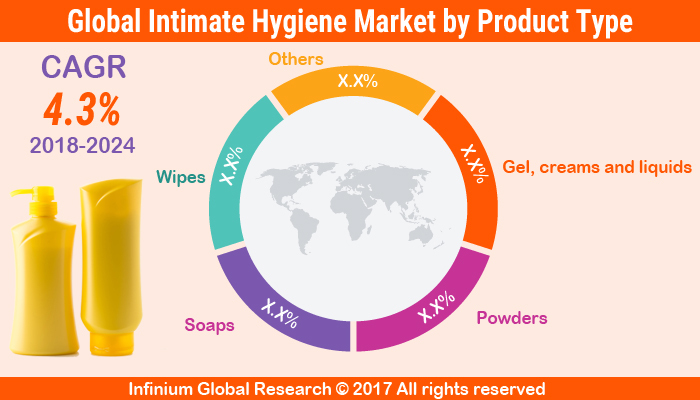 The global intimate hygiene market is expected to be driven by factors such as growing awareness about the personal care in the emerging and underdeveloped markets, increasing per capita income coupled with improving lifestyles of the middle class income group and continuous research and development and marketing programs of the leading market players. Moreover, innovations and new product launches in this market are likely to create more opportunities. Organic intimate hygiene products are likely to amplify the opportunities for the key players in the industry. On the other hand the incidences of allergy to the ingredients used in intimate wash products is likely to restrain the growth in this market. Globally, the perception about the use of intimate hygiene products is changing and women are open to try new products. Moreover, with the rise in corporate level employees the need for personal grooming is escalating at a rapid pace. The intimate care products not only help in keeping the intimate areas clean and odorless but also help prevent the communicable sexually transmitting diseases. Furthermore, a significant percentage of women population worldwide is adopting intimate hygiene products as these products help balance pH levels and protect the intimate parts from inflammations and infections. Moreover, growing disposable income and increasing number of working women has resulted in increased spending on personal hygiene products by women worldwide. Among the product types the gel, cream and liquid segment accounted for the largest market share worldwide, owing to the ease of use and effectiveness of these products. Moreover, owing to ease of use of wipes the market size of intimate wipes is likely to grow at the highest CAGR over the forecast period. Currently the global intimate hygiene market by end users is dominated by women accounting for over 75% of the market share in 2016 and 2017. Moreover, the demand from male end users is likely to grow at the highest CAGR due to increasing awareness about these products among men. Among the distribution channels, the supermarkets/hypermarkets accounted for the largest market share followed by drugs and pharmacy stores. The revolution in e-commerce is likely to augment the online sales of the intimate hygiene products over the forecast period. The leading players in the market are focusing on personalizing these products through online sales channels. Moreover, among the regions, currently North America accounted for the largest market share followed by Europe in the global intimate hygiene products market. The Asia-Pacific region is the largest consumers of sanitary products such as sanitary napkins, blades and pads among others, however, the awareness about the intimate hygiene wash, is yet to percolate in the region. Increasing middle class income and focus by the leading players in the region is likely to escalate the demand for intimate wash products over the forecast period. As a result, the Asia-Pacific intimate hygiene market is projected to grow at the highest CAGR among the geographies over the forecast periods. The report on global intimate hygiene market covers segments such as, product type, end user and distribution channel. On the basis of product type the global intimate hygiene market is categorized into Gel, creams and liquids, powders, soaps, wipes and others. On the basis of end user the global intimate hygiene market is categorized into male and female. On the basis of distribution channel the global intimate hygiene market is categorized into supermarket/hypermarkets, drugs and pharmacy stores, dollar stores, online and others. The report provides profiles of the companies in the global intimate hygiene market such as, Procter & Gamble, Glenmark, The Boots Company, InLife Pharma, Sanofi, Johnson & Johnson, Unilever, Unicharm, Edgwell Personal Care and Kao Corporation. The report provides deep insights on demand forecasts, market trends and micro and macro indicators. In addition, this report provides insights on the factors that are driving and restraining the global intimate hygiene market . Moreover, IGR-Growth Matrix analysis given in the report brings an insight on the investment areas that existing or new market players can consider. The report provides insights into the market using analytical tools such as Porter's five forces analysis and DRO analysis of intimate hygiene market . Moreover, the study highlights current market trends and provides forecast from 2018-2024. We also have highlighted future trends in the intimate hygiene market that will impact the demand during the forecast period. Moreover, the competitive analysis given in each regional market brings an insight on the market share of the leading players. This report will help manufacturers, suppliers and distributors of the intimate hygiene market to understand the present and future trends in this market and formulate their strategies accordingly.